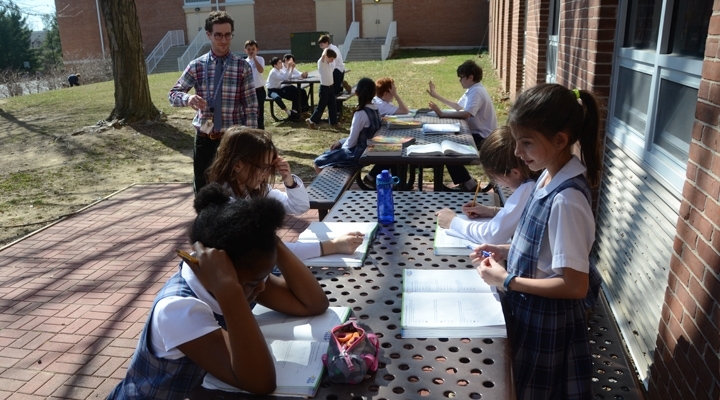 At Resurrection-St. Paul School, an Ellicott City elementary school, our intermediate department consists of the third, fourth, and fifth grades. Reading is taught in flexible groupings using the Treasures series by McGraw-Hill publishers with an emphasis on skill building. The English curriculum emphasizes the use of grammar and spelling in the writing process. At Resurrection-St. Paul School, an Ellicott City elementary school, we believe in excellence in education. The mathematics curriculum focuses on the development of new concepts through hands on activities and exposure of practical applications of skills. The mastery of computational skills is enforced through problem solving and daily practice. The areas of science and social studies are developed through discussion, hands-on activities, demonstrations, experiments and use of Discovery Education. During science class the students are engaged in lessons that allow them to explore for themselves and formulate an explanation, as well as allowing them to extend their knowledge and make connections to other disciplines and the outside world. The social studies curriculum is designed to link students to the world around them and give them an understanding of how our present day society was shaped. As an Ellicott City elementary school, we believe in a diversified curriculum. The intermediate grades join with the entire school in Liturgy and para-Liturgy celebrations. They also help to prepare these liturgies throughout the year. Through weekly guided meditations the students are able to familiarize themselves with the weekly gospel readings and strengthen their relationship with God. Spanish is taught twice weekly. Library, art, music, physical education, and technology classes meet weekly.